An EAPPI human rights observer reflects on the mixed emotions felt day to day while witnessing life under occupation. On October 9, Israeli settlers set first to a field of olive trees adjacent to the school in Jalud. 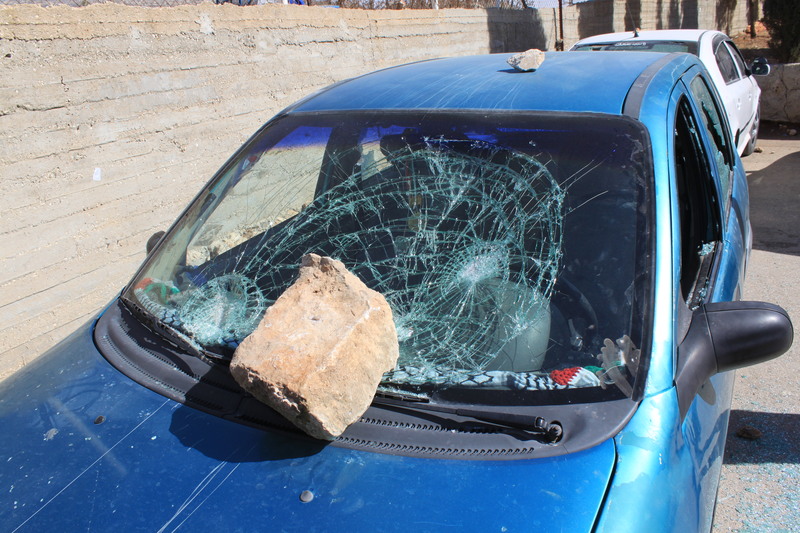 This afternoon we were called to a school in the Palestinian village of Jalud where masked men from a nearby Israeli settlement came, smashed the windows of 5 cars belonging to teachers cars and threw rocks at the classroom windows whilst the children were in class. The children told us they cried and were terrified. As we left the scene, we noticed smoke coming from the fields behind the school and saw that the settlers had also set the olive groves on fire. Only yesterday I helped my neighbours harvest their olive trees and just this morning a family, gathered in the shade of their olive trees, offered me tea as they were getting ready to harvest. I felt so privileged to be part of such an important family occasion. This afternoon was a different story. I felt useless as the flames and smoke forced me back. I watched scores of men and children run down from the school, breaking olive branches in an attempt to extinguish the fire and save not only the olive trees, but also people’s livelihoods. This is not a one off incident. Such acts of terror and intimidation are part of daily life for Palestinians in the West Bank, yet the Israeli authorities do very little to prevent such incidents or bring the perpetrators to account for their crimes. *This post was originally published on Orla’s personal blog. 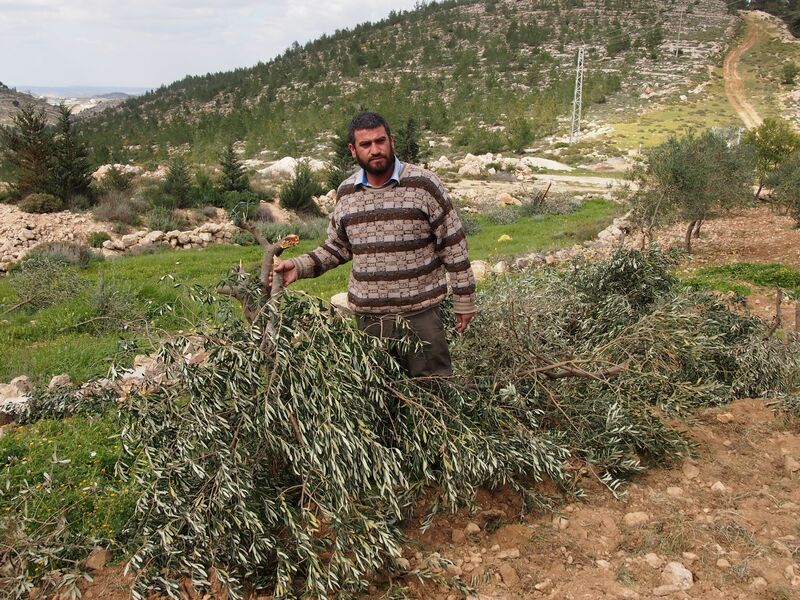 On October 13 at 3:00 am, Israeli settlers cut down 70 olive trees belonging to Palestinians in the village of Qaryut. The United Nations Office for the Coordination of Humanitarian Affairs (OCHA) reports that the olive industry makes up 14% of the agricultural income for Palestine and supports the livelihoods of approximately 80,000 families. A resident of Qaryut surveys the damage to his trees. Israeli settlers cut the branches of 70 olive trees. Collecting olives from the cut olive branches. Jenny Derbyshire, previously based in Bethlehem, was part of a team from EAPPI that travelled to Brussels recently to bring to light stories of Palestinians living under siege. Derbyshire, from Ireland, used her eye witness accounts from the occupied territory to urge the European Union to support the two-state solution for peace and stability in the region. In March this year, Raba Fanoun, from the village of Nahhalin near Bethlehem, discovered that Israeli settlers had come to his land during the night with hatchets and destroyed 80 mature olive trees, which his father had planted thirty years ago. This was nearly half the total number of his mature olive trees. The livelihood for his extended family depended on them. Later that day, volunteers from the EAPPI Bethlehem team visited Fanoun, to report on this destruction. “This is a big attack on your livelihood,” I said. “It’s not just our livelihood, it’s our life,” was the reply. During my three months in Bethlehem I was often in this village, which is under constant threat from settlements on the surrounding hilltops, including the huge nearby settlement of Beitar Illit. In April we were called out to witness and report on the military orders left under stones on village farmland, confiscating another area of land for the extension of the security zone around Beitar Illit. As part of a meeting of EAPPI representatives with EU officials in September this year, I was able to tell the stories from Nahhalin to members of the European Parliament (MEPs), permanent representatives, officials from the External Action Service and the cabinet of the commissioner for research. We showed them a photo of the building activity that we saw taking place in Beitar Illit, right above Palestinian farmland. Such establishments lead to the extension of the security zone, and run-off from the settlement sewage system polluting the Palestinian farmland and water supply. I was also able to show a photo of Fanoun with his destroyed olive trees and describe the impact settlement has on local people. We told the MEPs what Fanoun and the mayor shared with us. We also brought to them words of another farmer from Nahhalin: “What they call Area C is actually the future of Palestine.” What most people in the occupied territories shared with us was that “the situation is urgent, if the two-state solution is to have any chance of success”. For the visit to Brussels I worked as a team with two other former Ecumenical Accompaniers: Jonathan Adams from the United Kingdom and Dominika Blachnika from Poland were EAPPI volunteers in East Jerusalem in 2012; I was in Bethlehem this year and in East Jerusalem in 2012. So we also described the impact of the developments in the E1 area outside Jerusalem on the lives of the Bedouin people we had met there. This is now a well-known issue politically, but the stories from people living there and the impact of the loss of land, water and access to Jerusalem shows the level of displacement and deprivation. We linked this with the stories from the Bethlehem villages, where Palestinian people are also threatened by forced displacement. Their farmlands are disappearing into settlement construction, is claimed by the route of the separation barrier, and comes under repeated attacks from settlers. We shared what we had seen and passed on the words of the Palestinians we got to know during our stay; we shared maps and photos; we shared statistics. We reminded politicians that under international humanitarian law, which the EU upholds, Palestinians have a protected status and settlements are illegal. EU officials have recently taken steps through issuing EU guidelines on grants and loans to settlements. We hope that our testimonies will encourage them to continue in this direction and take the necessary actions for the resolution of the Israel Palestine conflict. This article originally appear on the World Council of Churches website and also appeared on Christian Today. The human impact of the separation wall and one man’s response to struggle. George Handal is a Christian born in Bethlehem. He grew up in a small house. When he raised his own family, he extended the house and added a second floor. In 1998, George began building a new house neighboring the old for his retirement, which he finished in 2010. A retired school teacher, George lives on a small pension with his wife Sylvia. Surrounding George’s house used to be land filled with olive trees. 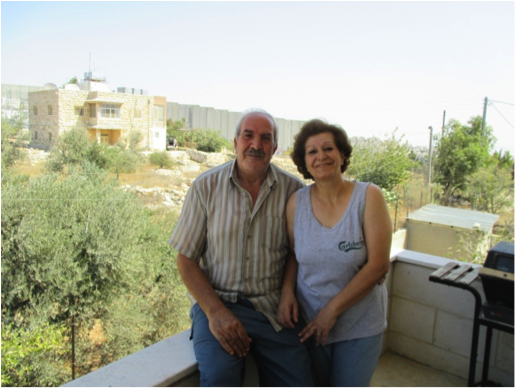 In 2005, however, the separation wall was built near George’s home and confiscated 15 acres of his land and 55 of his olive trees. George’s land and trees are located near the settlement of Har Homa. Due to fear of going near the settlement, George is afraid to go near and cultivate his land. Building of the separation wall began in 2002 after the second intifada. The Israeli government claims the separation wall stops the problem of suicide bombers coming from the West Bank into Israel. According to UNOCHA, however, 85% of the barrier’s route lies inside the West Bank, rather than along the internationally recognized border between Israel and the West Bank, known as the Green Line. The total length of the separation barrier is 712 km, twice the length of the Green Line. Although George’s house is only 6 miles south of Jerusalem, he only travels there 3 times per year. Before the wall was built, Jerusalem was only a 10 minute drive away, but George can no longer take his car through the checkpoint. George has Palestinian ID and only those with Israeli ID are allowed to drive through the checkpoint. Instead, George must obtain a permit, in order to travel to Jerusalem, which is not an easy endeavour. If he receives permit, he must walk through a pedestrian checkpoint. Finally, on the other side, he must take a bus or a taxi to complete his journey. Depending on the time of day, it can take one and sometimes many hours to pass through the checkpoint. Unlike George, many men from Bethlehem work in Jerusalem and must make this checkpoint journey everyday. Their day often begins at 4 am, when the checkpoints. Daily, over 5000 people will make this commute to work between 4 am and 7am. For George the building of the separation wall means not only a loss of a source of livelihood, but also the loss of freedom to travel to his ancestor’s land and to Jerusalem, a city he could freely visit only 15 years ago.